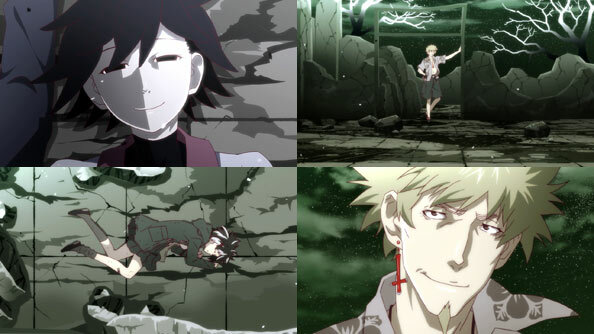 Those ‘battles to come’ Izuko mentioned at the end of “Mayoi Hell”? 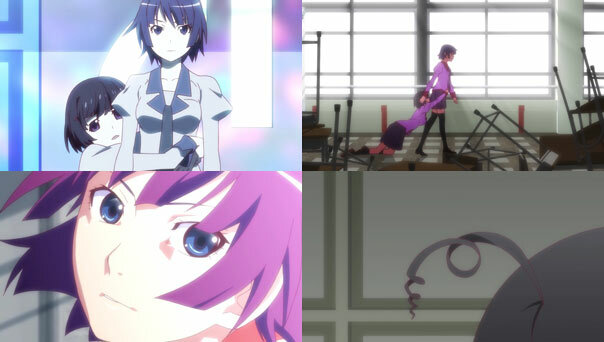 They weren’t fought or shown in Part Two, “Hitagi Rendezvous”. Instead they remain just over the horizon, foreboding in their present invisibility. 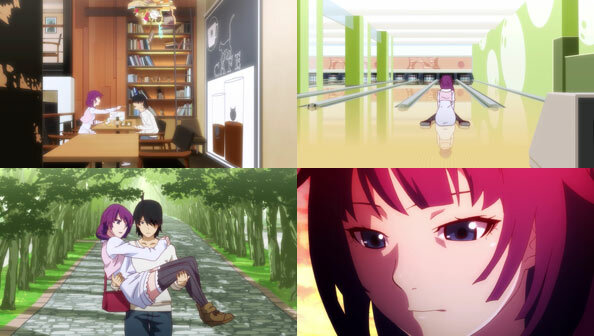 “Rendezvous” is instead primarily interested in re-introducing Senjougahara Hitagi as a prominent figure in Koyomi’s life. Even though she’s kinda always been prominent in his heart and thoughts, we’ve seen so little of her since Koimonogatari that even she seems to be struggling with her character…which is pretty hilarious. In any case, she’s saved up a ton of “points” that she intends to cash in on with a day-long date with her boyfriend (ending promptly by 7pm so she can have dinner with her father.) It’s also White Day, and they both graduate the day after tomorrow, so now’s the time to enjoy one last gasp of high school romance (before it becomes a college romance). Ononoki is still hanging out in Koyomi’s house, given the mission by Kagenui to keep an eye on him until ordered to stop (and implying if Kagenui never returns to recind the order, she’ll stay by Koyomi’s side the rest of her life). Tsukihi’s cameo consists of her grabbing and walking off with Ononoki, claiming she’s her favorite plushie. 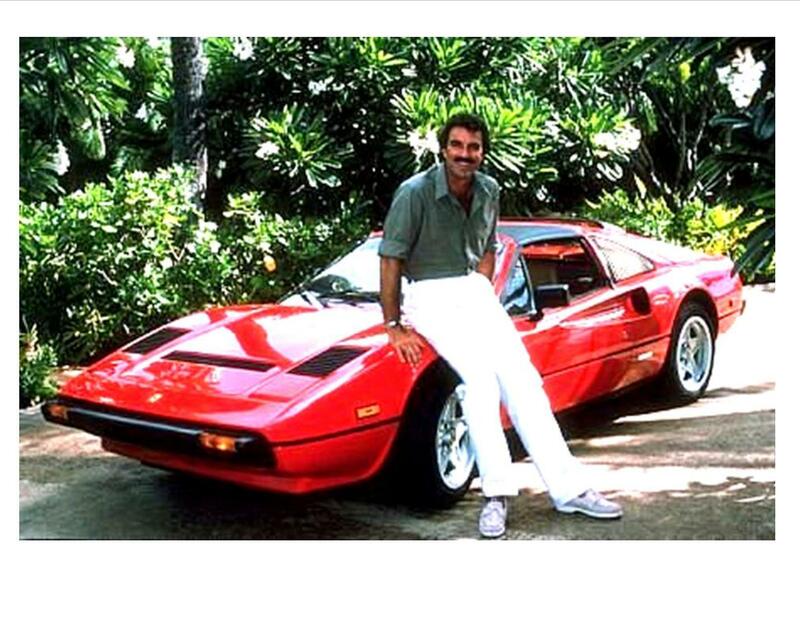 From then, it’s on to the date! Senjougahara has adopted a Hanekawa-style hairdo, and also acquired a driver’s license having aced her driving test on the first try. She also points out that until very recently (since his “return”) Koyomi has been unable to acquire a license, since as a vampire he wouldn’t show up in photos. 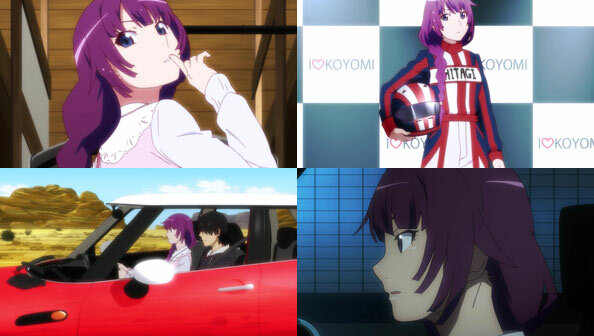 Senjougahara is not your cliched bad driving anime woman; she simply drives Koyomi safely and well without any drama to the first stop on their date: the planetarium. We and Koyomi first learn of her dream to draw the “perfect space map” of the celestial bodies that surround earth on all sides; such maps are shaped like a hand fan, which is also called…an ougi. Having recently experienced string of action-packed days—dying, travelling to the depths of hell, exams—one can forgive Koyomi for nodding off while lying on the comfy beds below the planetarium dome. When he does, he dreams of Ougi, and Dream Ougi seems to be just as “real” as her physical version. Instead of Senjougahara, it’s Ougi who shows Koyomi various constellations which match the animals that have represented the oddities/apparitions of his exploits. Shinobu is depicted as a Hydra, Hitagi a Crab; Nadeko the serpent. 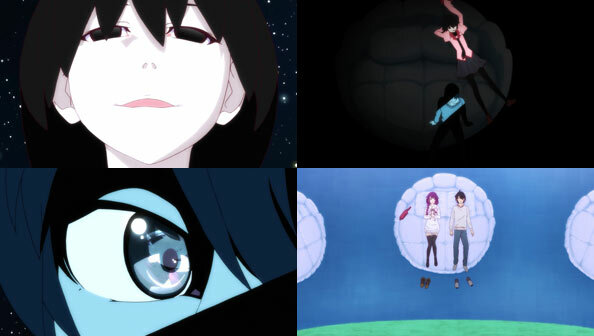 Ougi also tells Koyomi she represents “the principles of the universe”, further tying into the fan-shaped map of the cosmos, and tells him of her duty to “eject” those who “break the rules.” They include Izuko, Shinobu, and the newly-resurrected Mayoi. And she hopes, for Koyomi’s sake, he “forsakes” them, thereby assisting her in correcting the mistakes of the universe. 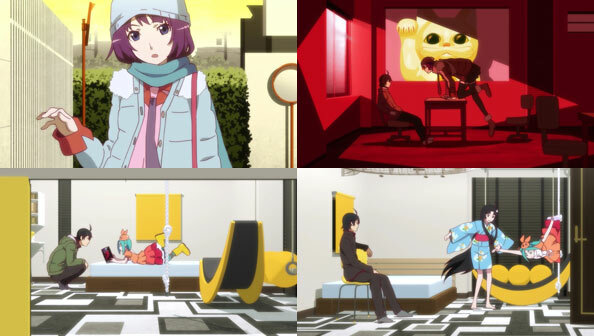 With that, Koyomi wakes up beside Senjougahara (who also nodded off), and from there, they jump from place to place on their date, following up the educational planetarium and science museum with lunch, bowling, and karaoke, with Koyomi unexpectedly beating her in the latter two categories. As “punishment” for losing, Senjougahara walks arm-in-arm and even lets him princess-carry her back to the car. Finally, after Koyomi admits he hasn’t been able to get Senjougahara a White Day gift, she parks the car by the waterfront and scolds him. 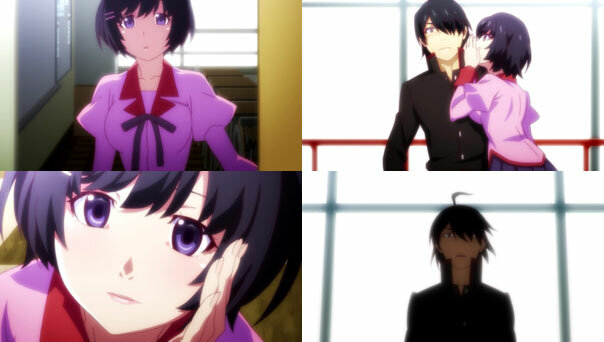 But he can make it up to her by taking her hand in his and calling her by her first name, Hitagi, which he does, in one of the most genuinely moving romantic scenes in the entire Monogatari series—and they don’t even kiss! It’s all in the signature closeups and Saito Chiwa’s delivery. 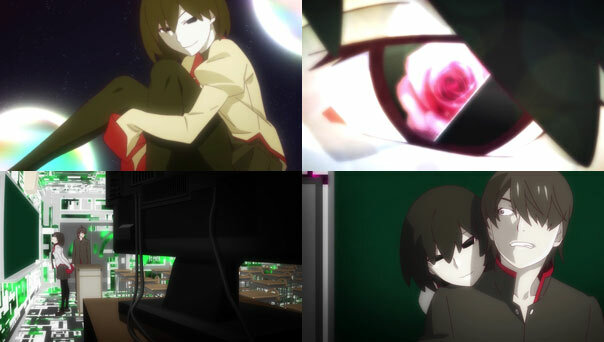 After the credits, Koyomi finds himself alone in another dreamlike dark space with Ougi, who implies his date with Senjougahara was his “last”, or might well be, depending on the choices he makes. If he wants to be Ougi’s ally, he’ll have to help her fight Izuko, “the big sister who knows everything”, and avoid her apparent traps. Koyomi begain Part Two with a monologue about how his story so far was one of self-preservation; preserving not only one’s life, but prioritizing his love for himself, to the point love with anyone else wasn’t possible. But since he fell for Senjougahara, he feels he’s been gradually losing his narcissism. So has that part of him taken the shape of Oshino Ougi, and is now fighting the “New Koyomi” who has come to love Hitagi more than himself? Sadly, those questions, and the battles for which Koyomi must choose a side, will not be covered here; this is the end of Owarimonogatari after just two episodes (Edit: apparently not)! But we can be fairly certain Koyomi won’t forsake Shinobu or Mayoi…and we’ll also see one of Koyomi’s inner thoughts—“to win there is an absolute need to lose somewhere along the way”—put to the test. Koyomi’s already lost his vampirism, for good and ill. Who or what will he lose in the final battle(s)? As Ougi pointedly remarks toward the end of this normal-length episode, This Is Different. Not only the fact that Owarimonogatari shifts the focus from her in the first episode (essentially an hour-long prologue) to Oikura Sodachi, who is suddenly back at school and asking Tsubasa all kinds of questions. Araragi is confident he can clear the air with Sodachi before Tsubasa gets back from the teacher’s lounge, but that doesn’t happen, because Sodachi, like Ougi before her, is different from every other woman he’s dealt with. 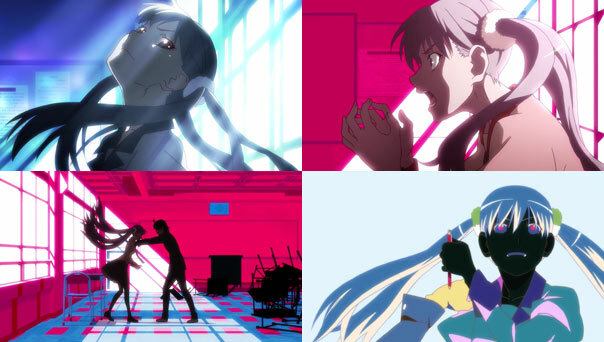 Different, because Sodachi hates Araragi. She despises him, and people like him with the heat of a thousand suns, as if he’d killed her parents (assuming she loved them, of course). So the smooth, easy reunion Araragi expected crashes and burns with equal force, as he can feel the hate suffusing every surface of the classroom, pushing all the desks and chairs back. No water under the bridge here. More like Sodachi wants to throw Araragi off a bridge, into that water, then burn his wretched corpse to ashes. Araragi’s usual charms and ability to take control of an encounter are utterly overthrown in Sodachi’s seething atmosphere of hate. When he tries to calm her by putting his hands on her shoulders, she quickly reaches for a mechanical pencil and stabs him in the hand. She won’t be calm. Within her is a storm that has been brewing for years. But how many, exactly—two, five, or more—is one of the mysteries this episode posits. 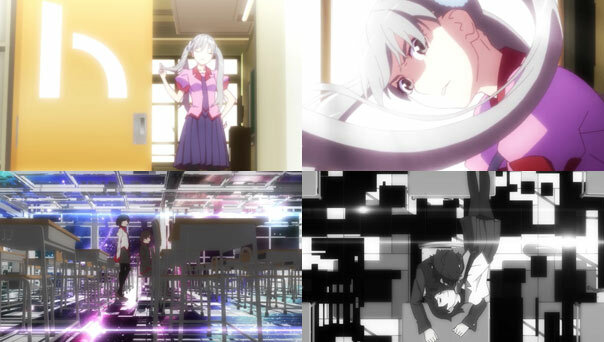 Sodachi greets Senjougahara by lamenting “how far she’s fallen” since the time she was a sickly girl she often took care of, since she’s now dating Araragi, a man who will never credit anyone other than himself for his happiness. But both of Sodachi’s barbs imply a desire in Senjougahara for some kind of repayment for her affections or efforts, where no such desire exists. Senjougahara concedes that Sodachi may be right about Araragi’s ungratefulness, but she doesn’t care. She likes Araragi and wants to go to college with him. She’s not looking for anything in return, nor is she keeping score; two more traits on which she and Sodachi differ. Sodachi applies math to all, and in the equations that express Araragi’s wonderful life, sees herself and others as crucial variables. For that, she demands recognition and renumeration, yet Araragi, she believes, pretends those variables don’t exist; that only the sum—his happiness—matters. 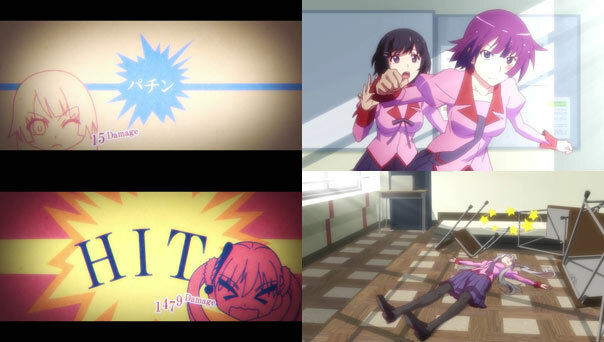 Sodachi’s comeback to Senjougahara’s admittedly condescending response to her protests is to slap her in the face (doing a scant 15 Damage), which only incurs a brutal counter-punch from Senjougahara (1479 Damage + KO). Proving she is The Best, Senjougahara then passes out herself and tells Araragi to handle the rest. If this cameo is her only appearance in Owari, she sure made the most of it! 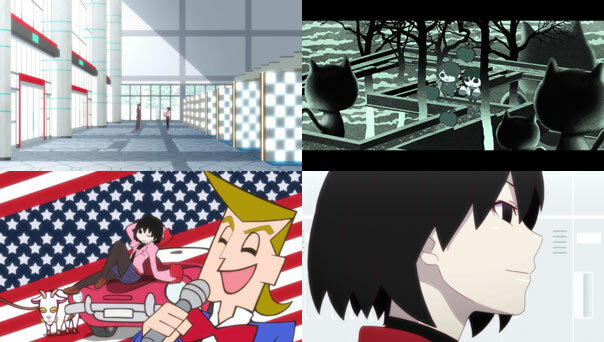 From there, Ougi’s role returns to the foreground, as she accompanies Araragi to his middle school and finds three envelopes marked “A”, “B”, and “C” in his shoe locker (why they end up in that particular place is explained by the Loki-like Ougi using gorgeous Escher-style imagery with SD versions of her and Araragi). Araragi recognizes these envelopes as a “Monty Hall problem“-type quiz: Three doors, behind one of which is a car; you choose Door 1; you’re shown what’s behind Door 3 (a goat), and you’re asked if you want to switch your choice to Door 2. Switching to Door 2 gives you a 2/3 chance of getting the car, compared to 1/3 sticking with Door 1. I liken Ougi to Loki because she’s very much a trickster, neither good nor evil, who has revealed next to nothing about herself while having an intense power to draw out quite a bit from Araragi. She’s also a lot like Monty Hall, a game show host (note the flashing checkered lockers), not only nudging Araragi to choose which way to go next, but also hosting a kind of This Is Your Life for him. (I’ll also note, Ougi takes a good long look at Nadeko’s shoe locker, both a callback to Nadeko’s arc, and another reason why Ougi is so hard to figure out). I say Ougi nudges him, but really, she’s pretty actively leading him deeper into his past, opening rusty gates and kicking in doors. That past is somewhere they both agree is the only place they have a chance of learning for sure why exactly Sodachi despises him so deeply. 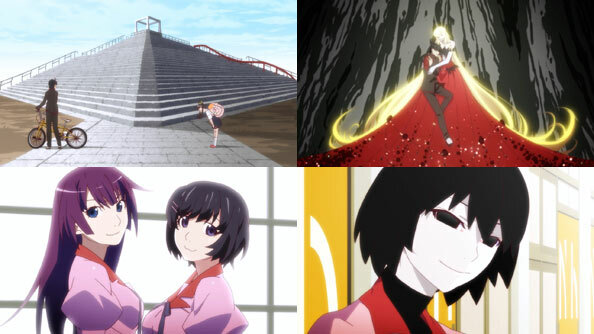 Ougi rules out the class assembly, as the exact timing of Sodachi’s return to school suggests she knew Komichi-sensei was the true culprit, not Araragi. Ougi surmises it may be more the fact that Araragi has “forgotten his roots”, though she admits a lot of people do that and aren’t automatically despised for it. 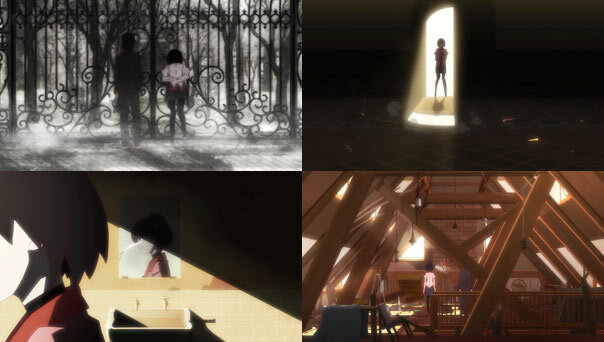 Her comments about who she was in grade school and middle school being “far beyond the boundaries of oblivion” and the feeling she was “born very recently”, which Araragi likens to the five-minute hypothesis, are both enticing nuggets about her, but don’t come close to painting a full picture. 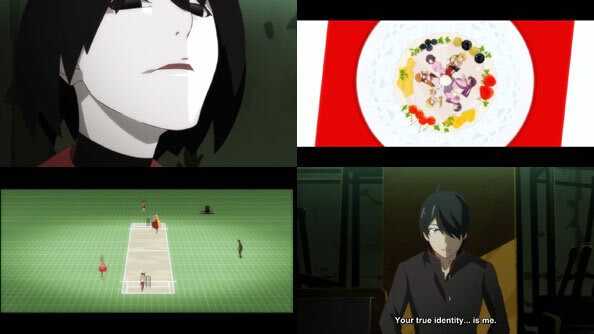 But it is the further exploration of that cloudy past, when Araragi’s childhood thought process and actions were strange, mysterious, suspicious, and scary all at once, where he and Ougi hope to excavate some answers and avoid future stabbings. Owari means “end”, so it looks like this latest story marks the beginning of the end of the Monogatari series, which is celebrated as an epic masterpiece by some (ahem) but derided as a tedious, talky, overwrought glorified harem piece by others (…jerks! 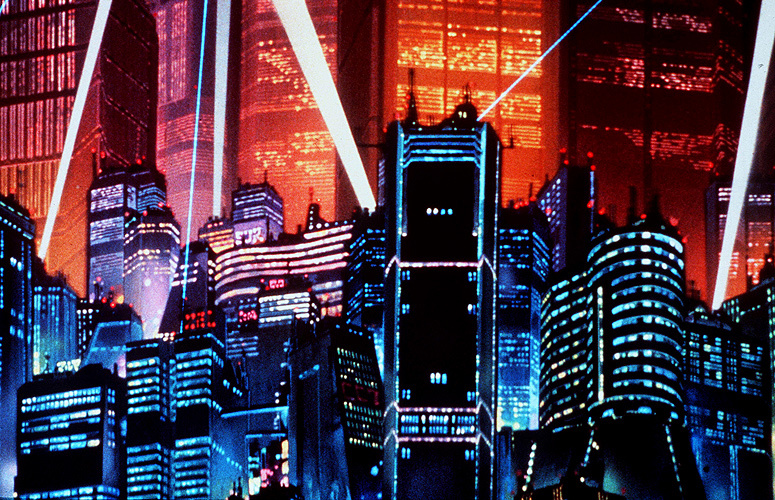 ), with any number of less extreme opinions in between. The cold open and tremendous OP indicate the primary subject of this series will be the enigmatic, doll-like, too-long-sleeved niece of Oshino Meme, Oshino Ougi, with a theme of mathematics, or numbers. But in a change from other recent series, Ougi isn’t the one with the problem, i.e. the oddity/apparition. Rather, the person with the problem is Araragi Koyomi himself. 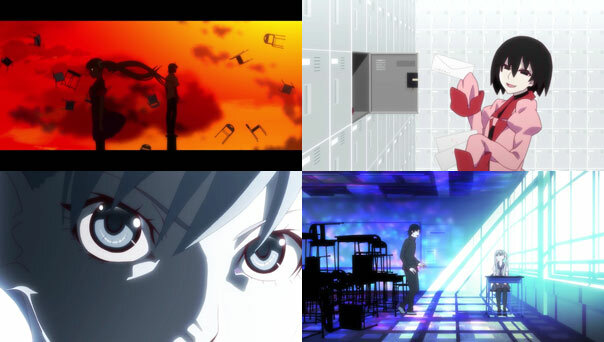 The setting of the episode is deceptively sparse—a locked classroom they can’t exit—but that classroom becomes the perfect stage for a dialogue that expands the setting across space and time, where Ougi establishes from Araragi’s testimony that the classroom itself is an apparition, likely one of Araragi’s own making. 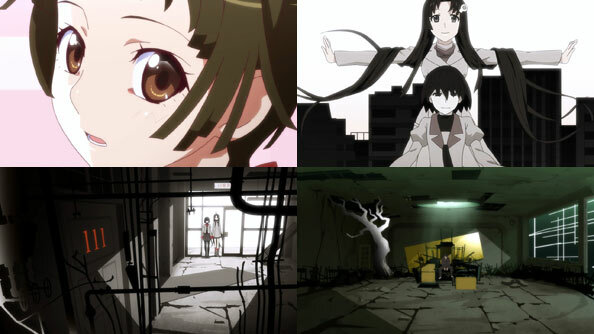 Combined with a less-rushed (for a weekly show) 48-minute runtime and a couple new takes sparkling visuals This latest narrative twist in the Monogatari formula keeps things fresh and exciting. The series has aired largely out of order, but there’s something both orderly and poetic about saving the end for last, only to go back two years to an experience that changed his outlook on life significantly and causing him to “put a lid on his heart”; at least until he meets Hanekawa Tsubasa. There’s a new face in this past story, too: the silver-twin-tailed Oikura Sodachi (very appropriately voiced by Kitsu Chiri herself, Inoue Marina). 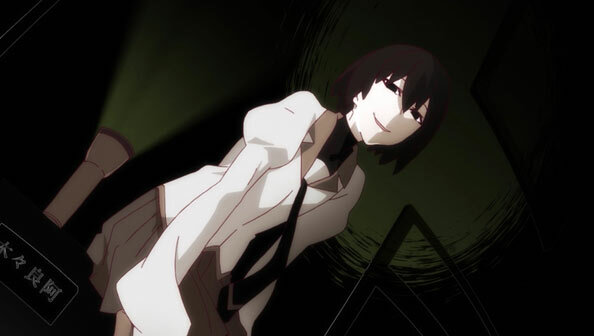 Two years ago, when she and Araragi were first-years, she assembled the class to ascertain the culprit in wrongdoing that led to an unnatural deviation in the math test scores of the class. Oikura can also be distinguished by her intense dislike, even hatred of Araragi Koyomi, because he always scored higher than her favorite subject, math. 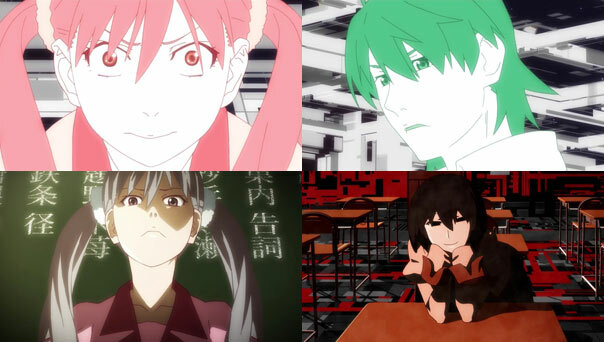 To add insult to injury, Araragi didn’t even participate in the suspect study group. But the assembly goes nowhere for two hours, with the students fiercely debating but not coming any closer to discovering the culprit. Oikura made Araragi preside over the assembly, but when he loses control, he goes back her her pleading for an end to this unfruitful madness. She relents, calling for a vote…and SHE is the one the class chooses as the culprit. Stunned, and essentially ruined as a student, she never returns to school after the incident, which makes sense as we’ve never seen her before in later series. 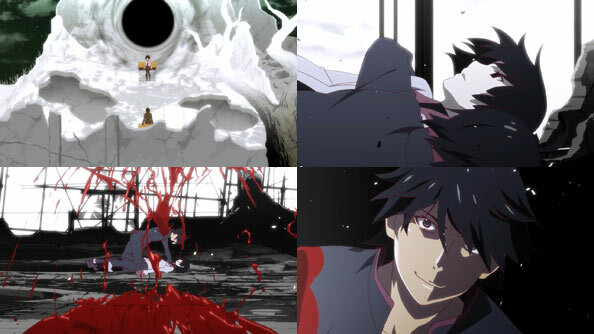 Araragi’s regret from the day of that accursed assembly was that he stood by and allowed the majority to make a determination in total absence of empirical evidence. Oikura was only chosen because most of the class chose her. 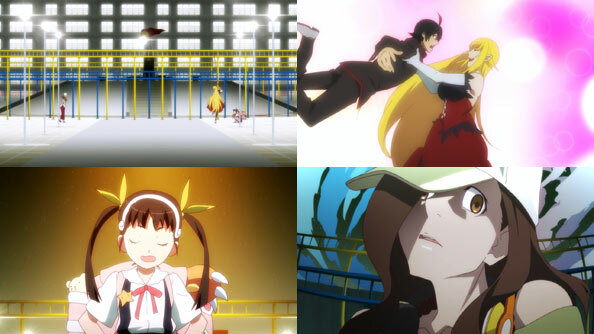 It’s an artificial justice and righteousness that never sat well with justice-obsessed Araragi, who adpoted the motto “If I make friends, my strength as a human decreases,” which he obviously would later drop once started helping out various oddity-afflicted girls. Oikura wouldn’t let anyone leave the classroom until the culprit was found, and they “found” her. Likewise, Araragi can’t leave the phantom classroom his regret created until the true culprit is revealed. Ougi wastes no time deciding it was the math teacher, Komichi Tetsujo, who was responsible for the odd test scores, by changing the exam to match the questions the study group used. In the end, Oikura organized the venue of her own demise, the assembly, as she was sacrificed by a teacher looking to improve her own stature, and the flawed justice of majority rule. And perhaps she miscalculated because she had so much emotional investment in the investigation, due to her resentment of fellow math whiz Araragi. 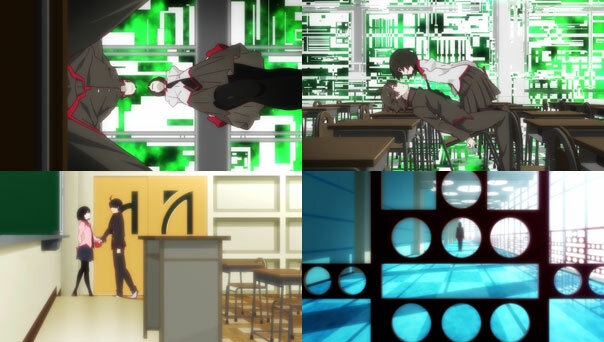 Now that Araragi knows the culprit for sure, the classroom returns to normal coloring, and Ougi opens the door and lets him out. The next day, when he checks the part of the school where the classroom was, there was nothing there; the apparition dissipated. Then he stops by his current homeroom, but in a clever inversion of the episode thus far, rather than being unable to exit, he can’t enter. That’s because Tsubasa is blocking the door, with news that someone has returned to school after two years: Oukura Sodachi, who arrives just as the teacher who destroyed her departs for maternity leave, as if the two were switching places. This should be interesting.